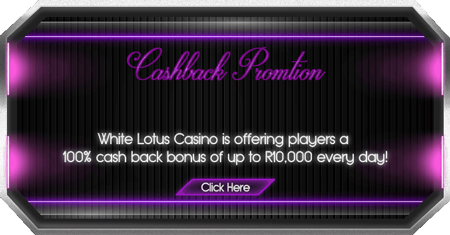 Players at White Lotus Casino qualify for the 100% Daily Cash Back Promotion of up to R10,000. White Lotus Casino has an excellent selection of casino games which are focused exclusively on South African players. With over 160 slots on offer, you can play well known games such as Aztec's Treasure, Coyote Cash, Enchanted Garden, Secret Symbol and anymore. For something new, try Dragon Orb, Kung Fu Rooster, Fucanglong and Snowmania. Win big with the Progressives Spirit of the Inca and Megasaur. White Lotus Casino accepts South African Rand players with a choice of deposit options to get you signed up. White Lotus Casino also features a Mobile casino platform, suitable to all major devices and offers a variety of high quality games like Wildcat Canyon, Ramesses Riches, Hot Wheels and many others. White Lotus Casino software is free, easy to download and navigate. Follow the instructions and your account will be created within minutes. The desktop version needs a download, for Instant Play and Mobile games no download is required. All available deposit methods are fast and secure and all banking transactions are protected by secure socket layer (SSL) technology. White Lotus Casino uses the latest in industry security measures. Personal details are protected with Secure Socket Layer (SSL) 128 bit encryption. White Lotus is PCI DSS (Payment Card Industry Data Security Standard) approved. White Lotus Casino has no less than 20 different table games with numerous versions of Blackjack, Roulette and trusted favourites such as Baccarat, Let 'em Ride, Pai Gow, Red Dog, Three Card Rummy, Tri-Card Poker and War. Video poker lovers can try for some hot wins with a selection of Aces & Eights, Bonus Deuces, Bonus Poker, Double Jackpot Poker, Loose Deuces, Sevens Wild and more. You can also try your hand at Multi-Hand Video Poker. 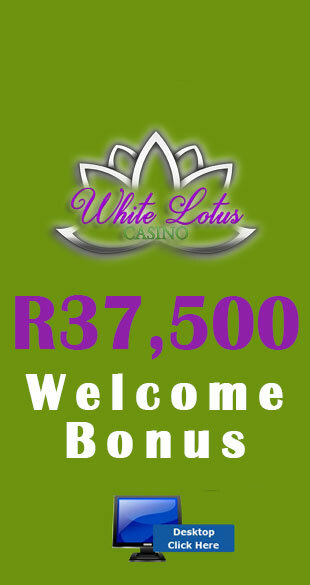 As a new player at White Lotus Casino you will receive a No Deposit Bonus or R300. The Welcome Bonus goes up to R37, 500 which is split up over your first 3 Cash Deposits into your casino account. White Lotus Casino makes use of the deposit bonus code system; take note that all deposit related coupons must be requested through the Cashier / Redeem coupon section Before making a deposit. 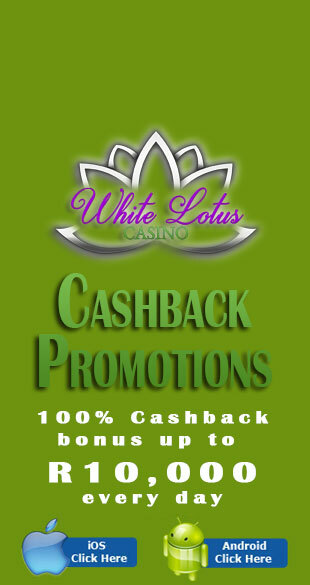 White Lotus Casino offers players additional Casino Promotions such as the 100% Cash Back Bonus up to R10 000 every day! Get 77 Free Spins for any new game that is released.